Carat is a unit used to measure gemstones. Careful not to confuse carat with karat as in “18 karat gold” which refers to gold purity. One Carat is equal to 0.2 grams. Carat weight is measured to three decimal points and rounded to the nearest hundredth with GIA Laboratories and to the thousandth of a carat with AGS Laboratories. It is further dividable into one-hundred points. For example a 0.74 point diamond weighs 0.74 carats or 0.740 carats depending on the verifying laboratory. It is important to differentiate carat weight and diameter. A 1ct diamond and a 0.85ct diamond can have the same diameter due to one stone being cut with a shallow depth while the other stone polished with a deeper depth percentage. For this reason, we recommend clients also consider the diameter of a diamond not just its carat weight to make an informed purchasing decision. Typically, the diameter of well cut round brilliant diamonds can be estimated. For example, a 1.00ct nicely cut round brilliant diamond will have am approximately 6.4mm diameter, a 1.5ct will measure about 7.4mm, and a 2.0ct 8.1mm. 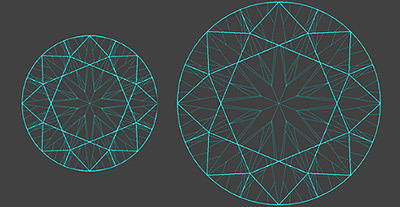 Diamonds cut too deep or shallow will deviate from these general guidelines. All things being equal between two diamonds except carat, a diamond of greater carat weight and size will have the potential for more fire (fig. 1). Fire is defined as the visible colored lighting events reflected from a diamond. This is due to the proportionally bigger facets and virtual facets in the larger diamond. The proportionally larger virtual facets will be more visible and visible with colored lighting events (fire). This is one of the reasons that clients naturally gravitate towards larger diamonds. Fig.1 Comparison of facets and virtual facets of a 6mm vs 9mm Round. Diamonds can range in size from a fraction of a carat to several carats. Diamond values increase exponentially as their carat weight increases. For example, moving up to a 1ct to a 2ct (same color, clarity and cut) diamond would not be double the cost as one might expect but can be approximately quadruple more. This is because larger diamonds are and order of magnitude rarer and also due to market conditions. Diamond values are typically determined by carat weight, and broken into half carat increments– also known as price point breaks. For this reason, all things being equal, a diamond weighing 1.50ct will be slightly more expensive than a diamond weighing 1.47ct. Choosing the right carat weight for your next diamond purchase is a very subjective choice. It’s important to note your budget and prioritize the Four Cs. Our advice is to limit the Four Cs into three Cs; Carat, Color and Clarity and never to compromise on Cut. Cut is the Four C that will effect the brilliancy and performance of a diamond. In fact, a finely Cut diamond will seem visually larger than a slightly heavier Carat weight diamond with a poor cut. Always take into account the potential ring design. For example, a large diamond isn’t absolutely necessary for a halo ring. The pave halo adds a diamond encrusted frame around the center stone, adding additional diameter, giving more finger coverage. If the ring is to be a solitaire, it would be advisable to prioritize Carat, within budget, to maximize finger coverage which would result in a stunning ring. If you have any questions regarding Carat, the Four Cs, or anything else that comes to mind please Contact us or Call (888)860-6430, we will be happy to assist you.